Colomer, D.; López, L.; Cares, C.; Franch, X.
Colomer, D. [et al.]. 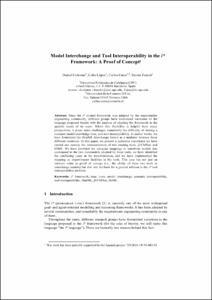 Model interchange and tool interoperability in the i* framework: a proof of concept. A: Workshop on Requirements Engineering. "Anais do WER11 - Workshop em Engenharia de Requisitos, Rio de Janeiro-RJ, Brasil, Abril 28-29, 2011". Rio de Janeiro: 2011, p. 369-382.